Exercise or stability balls continuously engage your core muscles, including your obliques, no matter which exercise you do. Because the ball isn't stable, you must use those muscles for stability and balance. Your internal and external obliques control trunk rotation and flexion, support your spine and improve your posture. Stability ball exercises can keep your oblique muscles strong. An oblique crunch is a beginner exercise, though a bit more advanced than the typical floor crunch. Place your ball on the floor, far enough away from a wall to allow you to extend your legs and brace yourself by pushing your feet against the wall. Drape yourself sideways over the ball. With your hands behind your head as if you were doing a regular crunch, use your obliques to lift the side of your torso toward the side of your hip. Keep your movements slow and controlled. Begin with five to 10 repetitions per side. Similar to the oblique crunch, the twist puts the exercise ball under your back and shoulders. Sit on the ball, then walk yourself out until your back and shoulders make contact. Hold a lightweight medicine ball or dumbbell above your head and use your abdominal muscles to lift your torso. Bring the weight to one side of your legs so that you have rolled a bit to the side. For an easier alternative, hold the weight in front of your chest and twist to your left and right. Do five to 10 reps on each side. 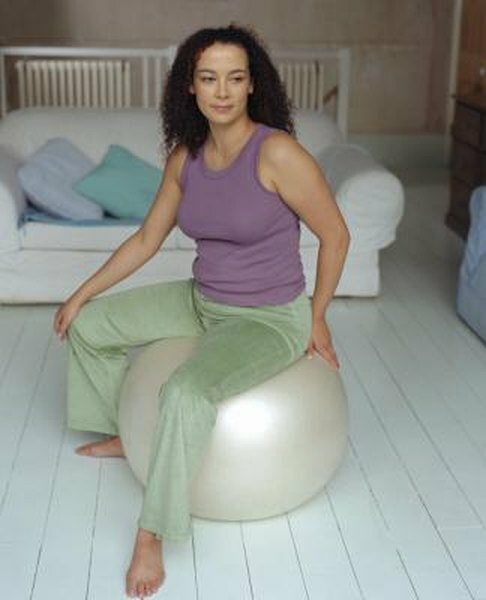 Sit on the exercise ball and walk yourself out so that your head, shoulders and back are on the ball. Your thighs should be parallel to the floor and your feet hip-width apart. Hold your hands above your head, elbows straight, palms together. Tighten your abs and slowly twist to one side. The shoulder you twist toward should remain on the ball, and your feet should remain flat on the floor, the American Council on Exercise (ACE) says. Hold, and then twist to the opposite side. Repeat five to 10 times, alternating sides. The walkout is an intermediate exercise in which you lie on your stomach over the stability ball and put your hands and feet on the floor at shoulder and hip width. Slowly walk forward on your hands so that the ball rests under your knees. Keep your shoulders, hips and legs aligned. Hold and slowly walk your hands back until at your starting position. Repeat several times. Add difficulty by walking out so that the ball rests under your ankles and the tops of your feet. Add further difficulty by continuing the prone walkout into the advanced pike exercise. Walk out until your toes rest on top of the ball; they should point toward your shins. Keep your legs extended and your body rigid as you lift your hips and roll the ball toward your chest, with your toes now pointed away from your shins. Your hips should end up almost directly over your shoulders. Slowly lower your body back toward the floor, then walk yourself back to starting position.